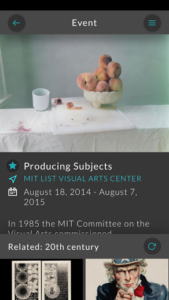 Artbot is a mobile website that encourages meaningful, sustained relationships to art through the discovery of cultural events and exhibitions in the Boston area. The application’s interface allows for two main modes of discovery: a serendipitous approach that allows users to explore linkages between events and exhibitions, and a recommendation system that suggests events based on a user’s interests. Recognizing that users often search for cultural happenings based on convenience, Artbot also allows users to find events and exhibitions by date and by location. On the backend, events and exhibitions are linked through a symbiosis of automated and human tagging and selection. 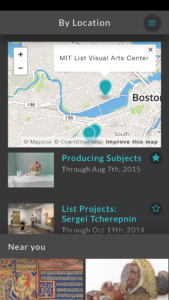 Custom-designed scrapers automatically pull and update event information from museum websites. Automatic topic modeling and entity recognition tools capture event descriptions and identify the artists, mediums, art movements, and geographic locations that these events represent; these entities are then linked to other events with related entities and concepts. Human curators may also intervene and link artists to movements, or locations to concepts, which serves to improve the automated linking system in turn. Like the app’s frontend design, this flexible tagging structure aims to inject fresh, unconventional, and playful connections between events. Artbot’s technology stack consists of three interlocking applications. The core database and API are written in Ruby and Rails, while the data scraping and natural language processing tools are in Python. Artbot’s technology stack also leverages free and open source services like the Stanford NER, DBpedia, OpenCalais and Zemanta. Forthcoming plans include releasing components as open source and integrating with MIT-based arts discovery startup Trill. Read more about the project at MIT News.